After much criticism for not properly looking over the issue of virus, trojan, malicious software and much more. 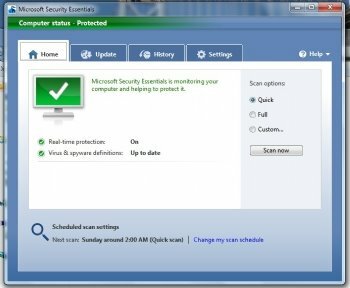 Microsoft has finally acted by releasing a Beta version of its anti-virus software called Microsoft Security Essentials Beta. We at Shankee put a look on it, on whether it is worth downloading or not. Windows has been target victim of more viruses, malicious software, hacks than any of its competitors including apple or linux. It may be the fact as more people use Windows OS than any other Operating System. But still Microsoft has not done very much in enhancing security measures for windows. The Widows Defender they gave out with Vista did nothing much and was more of useless in securing the system, actually on Windows 7 site i found that they were actually promoting antivirus makers who made anti-virus exclusively for Windows 7 these included Norton, AVG and Kaspersky, later on more were added. I had always been very cautious of viruses and other malicious software and due to my preventive measures i have made my computer virus free for over 2 consecutive years now, een when i am plugged to the internet for over 8 hours a day. Security Essentials is easy to install and easy to use. Updates and upgrades are automatic, so there’s no need to worry about having the latest protection. It’s easy to tell if you’re protected – when the Security Essentials icon is green, your status is good. It’s as simple as that. The security Essentials did really well on virus and malware tests. And we think Microsoft will be heavily testing this for sure, and any loop holes will get huge publicity. The Software instantly warned when you would be downloading a malicious software and would immediately stop the download in between. The Windows Security Essentials is really good and soon would give a tough competition to its competitors. So please comment would you actually download the antivirus from Microsoft.